Today, I’m one of several Orange County bloggers that will be volunteering at the Someone Cares Soup Kitchen in Costa Mesa, CA to serve a hot meal to the the hundreds of men, women, and children that come between 1:00 and 4:00 p.m., Monday – Friday, for what is their only meal of the day. Organized by Marcy Massura, co-founder of BlogCrush,the blogger meetup is a way to give back during this season of giving and to honor the efforts of Corey Donaldson and the $50K in 50 Days campaign. Currently, Someone Cares Soup Kitchen serves more than 450 guests per day, seven days per week. Meals are provided Monday through Friday from 1-4 p.m., and a pancake breakfast is served every Saturday and Sunday morning. Of those served, approximately 25 percent are families with school-aged children, 30 percent are homeless, 20 percent are working poor or unemployed, 15 percent are senior citizens and 10 percent are mentally or physically challenged. In 2009, Corey Donaldson and his taskforce successfully spearheaded a campaign to raise $40,000 in 40 days for Someone Cares Soup Kitchen’s holiday programs. The campaign allowed Someone Cares Soup Kitchen to fill 450 backpacks with more than 14,000 items, host a holiday dinner for 1,200 and give away more than 3,000 new, unwrapped toys as well as support the soup kitchen’s ongoing programs, including its tutoring center for at-risk kids. This year, the team aims to raise $50,000 in 50 days. CALL TO ACTION: To play your part in helping the less fortunate and show someone that you care, visit Someone Care’s Soup Kitchen $50K in 50 Days . 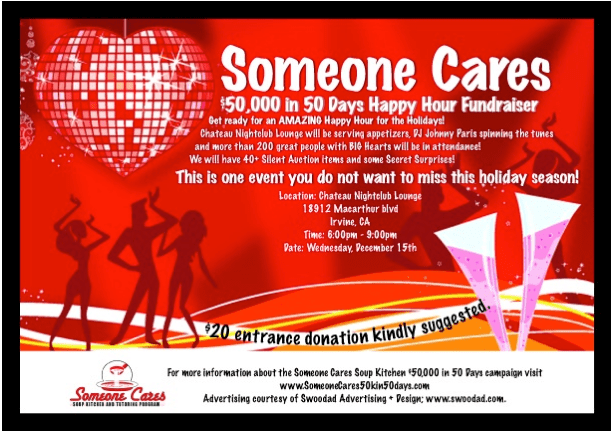 Also, tonight is the Annual Someone Cares Soup Kitchen Happy Hour Holiday Fundraiser at Chateaux Ultra Lounge. Along with an extensive assortment of complimentary appetizers, DJ Johnny Vegas will be spinning the tunes, you can bid on 50+ Silent Auction items, and be in on some big Secret Surprises! More than 300 great people with BIG Hearts will be in attendance and you should be one of them! Thanks for helping to raise awareness about such an important cause! I’m off to check out their website now! @Faith – Thanks for your interest. I know you don’t live in this area, so for people who would like to donate to help families every where, click on the Share Our Strength badge in the sidebar. I LOVE tamales. My mom used to make these for us all the time when I was younger. She is a California native so they were definitely something we had in my house all the time. It is a shame that so many people don’t even know what a tamale is on the east coast…I get so depressed when I say I am craving one and they look at me like I am sporting a third eye ball, haha…thanks so much for sharing! Great place to volunteer, we usually help at the food-bank every year. I will share this with my kids.